I love being outside. I don’t care where, as long as the air smells crisp and there’s a coolness on my cheeks. But there’s only so often that a stroll around a tarmacked town can charm you, and on this particular day, I was feeling rather ambitious. Go Ape level-ambitious. I arrived at Leeds Castle dressed in my best-worst clothes. It was a bright day, the sky blue and underlined by one long cloud that rolled along like steam from a train. I stood in a circle with a dozen other people, each of us looking as apprehensive as the next, each of us attempting to hide it behind a somewhat exaggerated smile. One at a time we stepped into our harnesses, polo-wearing staff members tightening the straps around our thighs in a level of intimacy I was not prepared for on a nonchalant afternoon off. We had a short practice, walking our way around a mini-course, ensuring we were well-versed in ropes and carabiners. After learning the various options for landing from a zip wire (essentially a choice between injury or a knickerful of bark chips, neither of which I’m terribly fond of), we were approved. Tick. Gold star. You may now ascend a tree. The ladder was worn, frayed rope and wooden slates. The safety wire creaked as I climbed, jolting slightly, holding me back like a responsible arm around an overexcited child. I reached the platform, placed my hands on the splintered wood and hauled myself up. The harness dug into my thighs, reassuring, I’m here, I’ll keep you safe. I believed it, but not enough to stop me wrapping my arms around the tree trunk and stroking the knotted bark. A smirk. A giggle. This is ridiculous. I wouldn’t say that I, in that moment, encountered a full-on brown-trousers level of fear. It was more unease, an awareness that if I somehow fell off, I would make a mighty fine piece of impressionist art on the ground. But it was a feeling I somehow liked, a little exhilarating danger, a cheeky wink of a more unfamiliar aspect of life. I reached the Tarzan swing. A rope, a net, a gaping abyss of shrubbery. I wasn’t overly eager. I reeled the rope in and sat on the edge, feet dangling, fully aware that all it would take was one faulty piece of Velcro, and my Millets shoe ownership could reduce by 50%. The little bit of sanity I had left sat on my shoulder like a misplaced hamster, lecturing me. Don’t jump off the thing. Why are you going to jump off the thing? Bloody hell, woman, you don’t need to do this. Sure, it cost 32 pounds, but- wait a minute, you actually paid to be put through this? You’re on minimum wage, sunshine, why would you do that? Screw this, bloody jump, you’ve earned the fear. I slid my bum off the edge, inducing a miniature wedgie that did little to distract from the whole plummeting-through-the-air scenario. I screamed; a big, girlie, the-nasty-boy-pinched-me sort of scream. Sugar coated and sprinkled with glitter. As I face-planted the net it mutated into hysterical laughter, snorts and cackles cartwheeling over one another at an alarming pitch. I let myself bounce off the net a few more times, kicking my legs out like a can-can dancer while my ponytail slapped against my shoulder. This I liked. I reached the final zip wire. It’s an odd feeling, watching a metal wire twist out into the distance and knowing it’s the only thing stopping your juicy remains from manuring the field below. 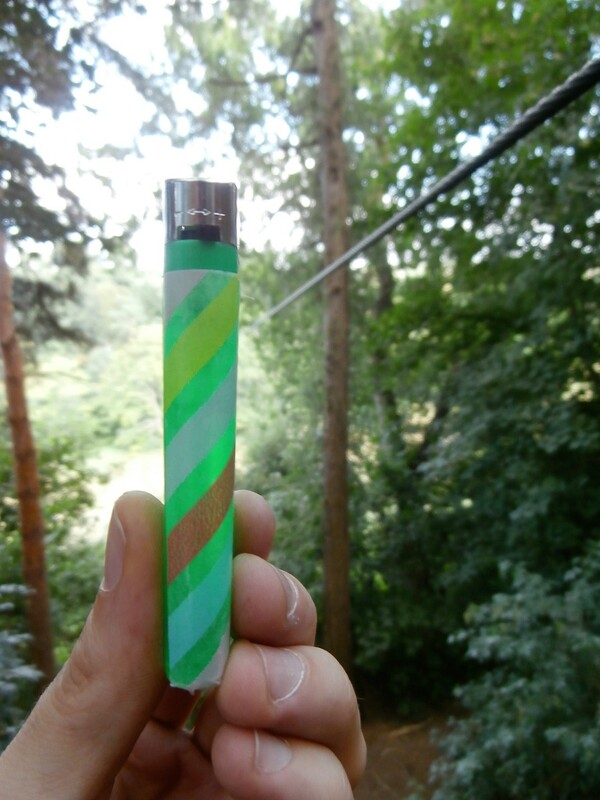 I took a moment to hold up my lighter, every colour spread across it in the perfect summary of my childish glee and adult fear. I bent my knees and lifted my feet off the platform, fingers twisting tighter around the safety ropes with each metre I slipped further away from solid ground. There was the sound of friction and metal above my head, a slight creak of my harness below. I slipped out of the forest through an orifice in the trees and hung above a field. White clouds spread through the blueness like flour on a chopping board, sparse and powdery. I peeled my fingers away from the rope, one by one, fluttering an arm freely in the air. It felt good. I stretched it out further until I could almost stroke the wind, blue and white on my fingertips. I spread my other arm too until I hung free, spinning gently, and laughing. Too soon I slipped back into the forest, landing hard on the umber ground. It smarted, and yes, there was bark in my knickers. But I had earned those wood-embellished pants, and it was with great pride and slight discomfort that I gingerly walked back to the cabin. I had conquered the forest.